Greene Tweed, a global industry leader in elastomeric sealing technology, announced today the introduction of its Fusion™ brand of engineered fluoroelastomer compounds. Greene Tweed is widely renowned for its Chemraz® brand of FFKM (perfluoroelastomer) seals, which has the broadest chemical resistance of any elastomeric material, along with the resilience and sealing force needed to withstand extreme temperatures and pressures within the most challenging applications. The Greene Tweed Fusion™ family of fluoroelastomer compounds is engineered to deliver superior sealing performance than standard FKM materials in challenging operating environments. Fusion™ elastomers have been engineered to withstand conditions such as chemical and plasma exposure, rapid gas decompression (RGD), low and high temperatures, and to ensure minimal metal and particle contamination in clean environments. The Fusion™ product line combines Greene Tweed’s engineering, design, application knowledge, and materials expertise, continuous product improvement, and high-touch customer support and collaboration to develop highly engineered solutions that meet the rapidly evolving needs of the diverse markets we serve. 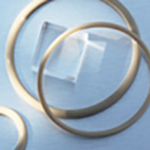 Greene Tweed is a leading global manufacturer of high performance sealing materials and engineered components. Combining more than 150 years of technical expertise and commercial knowledge in a variety of markets, Greene Tweed collaborates with customers to develop engineered solutions that meet challenging performance requirements and reduce total cost of ownership. Greene Tweed products are sold and distributed worldwide. For additional information, contact Greene Tweed at +1.215.256.9521, or visit our website at www.gtweed.com.